Stop by ARTspot Saturday March 28th to try your hand at the first steps of wire jewelry! Ellen Chappelle will be here from noon until 2:00 pm, along with a pile of wire, beads and tools. She has two classes here at ARTspot for drop dead beginners. Really! 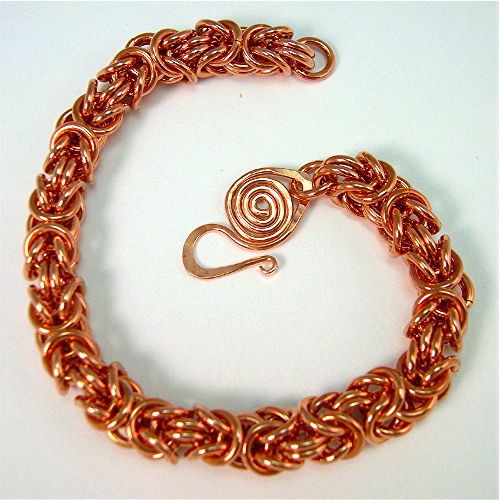 YOU can make Chainmaille and Wire Wrapped Jewelry! The ancient art of chainmaille has moved from the battlefield to the home front! No longer reserved solely for armor, chainmaille is jewelry design at its most classic. In this class, you will learn the proper way to open and close each little ring, as well as how to weave them into breathtaking jewelry. The beautiful Byzantine weave is deceptively easy (shhhh!) and the perfect place to begin your love affair with chainmaille. Class fees include materials kits complete with chainmaille rings, beads and findings. $45 tool kit (optional and payable to the instructor via cash or check made out to Ellen Chappelle during class) The tool kit is yours to keep for all of Ellen's classes and future projects you will make on your own! If you don’t want to purchase tools, you must bring two pairs of your own jewelry pliers -- two flat nose or two chain nose or one of each.